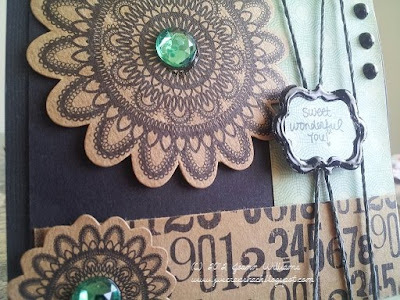 ~Jo's Scrap Shack~: Simon Says "Sweet Wonderful You"
Simon Says "Sweet Wonderful You"
Happy Friday blog friends!! Have you ever glanced at your "to-do" list and said to yourself " I have all week to get this done" and then before you know it, the week has flown by and you have not accomplished much?? Well that is what happened to me this week! LOL I had so much to do and unfortunately I'm behind. But today I am playing along with Simon Says "Anything Goes" challenge. So here is my card "Sweet Wonderful You"
My card today is a 5x5 Black Bazzill card base. I wanted to try the black on black tone and I liked how this came out with just a splash of color. My patterned papers are by Echo Park's This and That collection and MME's Kraft Funday Everyday Fun collection. 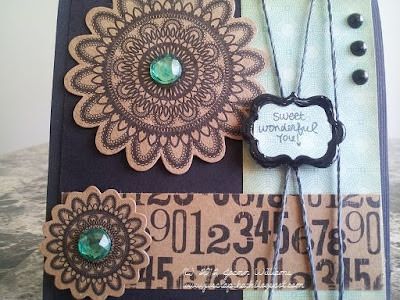 My sentiment "Sweet Wonderful You" is from Paper Trey Ink's Handwritten Notes stamp set. I stamped this with momento tuxedo black ink and used my EK Success punch to punch it out and layer. I used some glossy accents on my sentiment frame to give it a little bit of a shine. The doilies are from Maya Road and all I did was add a rhinestone in the center of each for a bit more color. I used some of Lawn Fawn's Lawn Fawn trimmings Cord in gray to wrap around the patterned paper and finished the card off by adding a few black pearls to the top of the card. Well I hope you enjoyed my card for today and thank you for stopping by! Have a great weekend!!!!! Hi Joann, I know what you mean about time flying bye. I sometimes think I have all the time in the world and before you know it I'm rushing to get a card for a challenge done. But some times that's when we do our best work. This card is amazing truely beautiful. I love the Bling and the doily die cuts and the paper you chose is great. h and that stamp so cute. Hugs! Fantastic card!! Love the color scheme that you used!! Thanks so much for joining us on the Simon Says Stamp Challenge blog. Very pretty Joann. Love the colors, the doilies... the framed greeting looks great.